Ninjago is one of those themes like Harry Potter where it's largely castle-relevent, but then throws in something completely anachronistic like a giant robot. But check out the newly announced 70751 - Temple of Airjitzu. 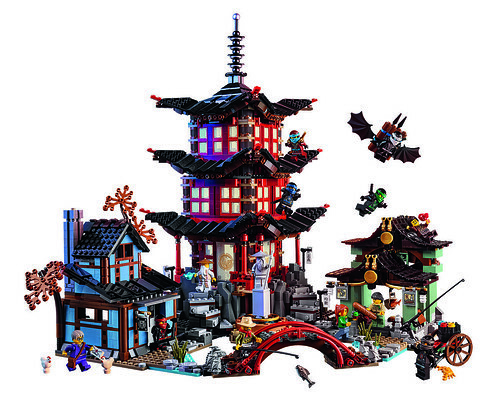 Leaving aside a couple of the figs, this beautiful set would fit perfectly alongside an Asian-themed castle layout. Pricey, though - Brickset says it will be US$200. Oh, looks really cool! Much better than earlier sets of the line in my opinion. Interesting work on the roofs also. It looks pretty nice, to be sure. I'm especially amused that they seem to have recreated this Ninja-era polybag set. I love the overall design and the roof on the right, but still... pricey. I was admiring the roofs as well, particularly the building on the right. I think that's the old garage door element, which is a pretty cool idea. I also like the combination of the flexible technic axle and the dino tails to get the curve on the bridge. Azaghal wrote: It looks pretty nice, to be sure. I'm especially amused that they seem to have recreated this Ninja-era polybag set. I think it is very cool! Not in my current budget, but really a fantastic looking set. The Ninjago designers have really been out doing themselves in this last line, overloading us FOLs with great pieces and colors. This is no exception. This set looks awesome. It will fit in nicely as the centre piece to my Ninja sets. It's a really beautiful set, and worth the price. I'm considering it even though I don't do anything Asian-themed. Of course, I could easily port that blue building into my town layout with hardly any alterations, so it's not like it would be useless to my displays. Mainly, though, it looks like a great piece to mount on a shelf in your living room. I just need a bigger living room! I don't follow Ninjago at all, but I always thought this set looked really awesome. It slipped my mind for a while, but I've been eyeing it up again lately and I find myself wanting it more and more. I think the important distinction is that it's not trying to be ridiculous like most of the Ninjago line, it is simply a well-designed Japanese/Ninja set that happens to have the Ninjago name and characters. The buildings look fantastic. The parts usage is incredibly creative, especially for the roofs and curved bridge. Including 12 figures is also wonderful; remember, I'm the guy that complains about how few figures are in modern LEGO Castle sets. This is the best historical LEGO set at least since Medieval Market Village, and perhaps it's being somewhat ignored because adults (who can afford a $200 LEGO set) aren't huge fans of the theme that supports it. I know "Ninjago" and "$200" both curbed my initial enthusiasm, but just looking at this as a stand-alone set, it seems truly amazing. This has moved to the top of my Want List, (tied with Brick Bank), and I will probably buy it in July to get the free Castle set. I'll likely have more to say about it then, so I'll stop ranting and raving for now.